The Gillespie Pass is situated in the Mt. Aspiring National Park, at the head of Lake Wanaka. This package is especially suited to those who enjoy remote wilderness, away from the well-travelled tracks. Previous hiking experience is recommended. 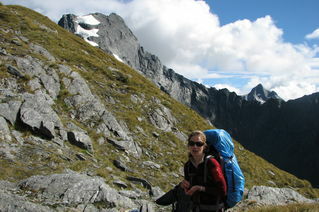 This is an excellent 3 day circuit with spectacular mountain views starting in Makarora. 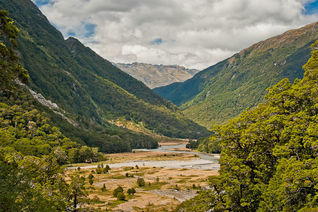 Walk up the Young Valley filled with silver beech, and enjoy the alpine vegetation as you cross the Gillespie pass and move down into the Siberia Valley. Finish the trip with an exhilarating jet boat trip down the Wilkin River. 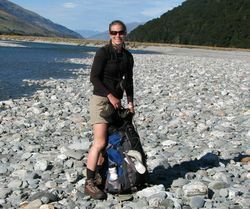 Arrive in Lake Wanaka, settle into accommodation and prepare for hike. OPTION – Enjoy a meal of New Zealands finest lamb or venison and local wine with your iTrek hosts. Travel to Makarora and begin to walk. 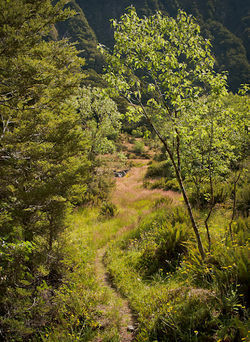 Cross the Makarora River and walk up the Young Valley to Young Hut, with views of the bush and valley floor. (6 hours/20 kms). 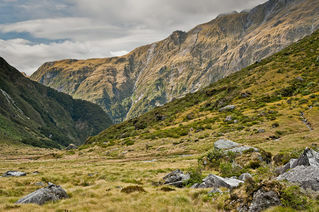 From the hut, continue to the bushline, and cross the Upper Young. After 20 minutes begin the climb up to the Gillespie Pass. After a steep climb, the Pass is reached, and you are rewarded with impressive views. (Mt. Alba dominates the skyline). Drop down into the Siberia Valley and reach Siberia Hut. (7-8 hours/26 kms). Continue down the Siberia Flat before entering the forest, and descend to the Wilkin River. Be met by the jetboat, for a relaxing ride down the Wilkin. You turn up the Makarora River, and arrive back at Makarora. Be met by your iTrek hosts, and be transported back to your accommodation. Stay at Siberia Hut for one extra night, and walk to Lake Crucible and back. (An excellent day walk). RELAX, WHATEVER YOUR INTEREST, YOUR iTREK HOSTS WILL BOOK AND TAKE CARE OF IT FOR YOU. Optimal dates, Dec - April. 3 day / 2 night hike. Package 5 days. Dept. of Conservation serviced huts, and B & B with iTrek hosts. Breakfast with iTrek hosts. Supply and cook own meals on hike. Wanaka airport pickup / dropoff. Track / hut fees and jet boat ride. Detailed briefing of track with George Scott. Track Map and information pamphlet. Help with purchase of food and other requirements for track. Transport to Makarora and return. Free car parking and bagage storage. Ask about our wine tour special.